The job of a salesperson is one that is often met with endless negotiations and searches for customers. A salesperson must always be prepared with what could happen during transactions and must also be able to pick him/herself back up after losing sales or customers. What makes a great salesperson is more than just the high percentage of sales he/she generates, but also how the customers look at him/her. 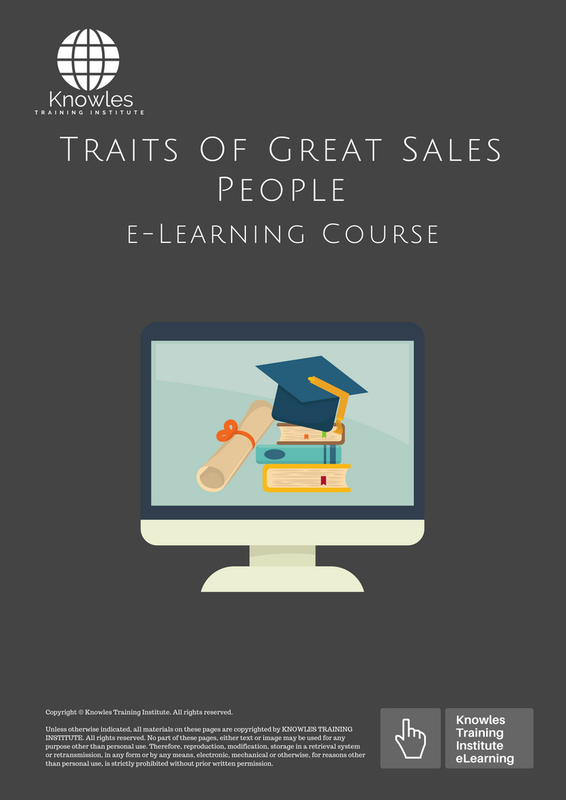 In this course, the participants will learn what traits make someone in sales a name to be looked up. It will provide an easy-to-follow guide that encourages sales employees to follow and embody in their quest to become one of the greats. 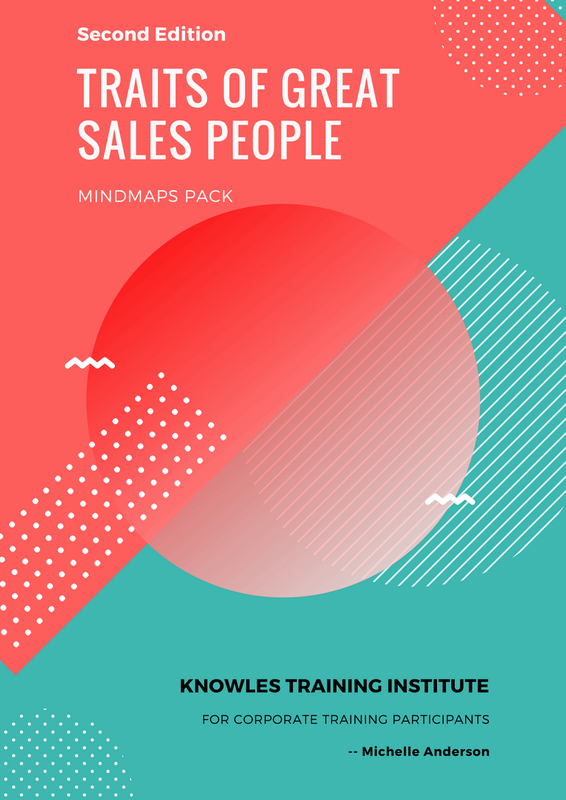 This Traits Of Great Sales People workshop is ideal for anyone who would like to gain a strong grasp and improve their Traits Of Great Sales People. 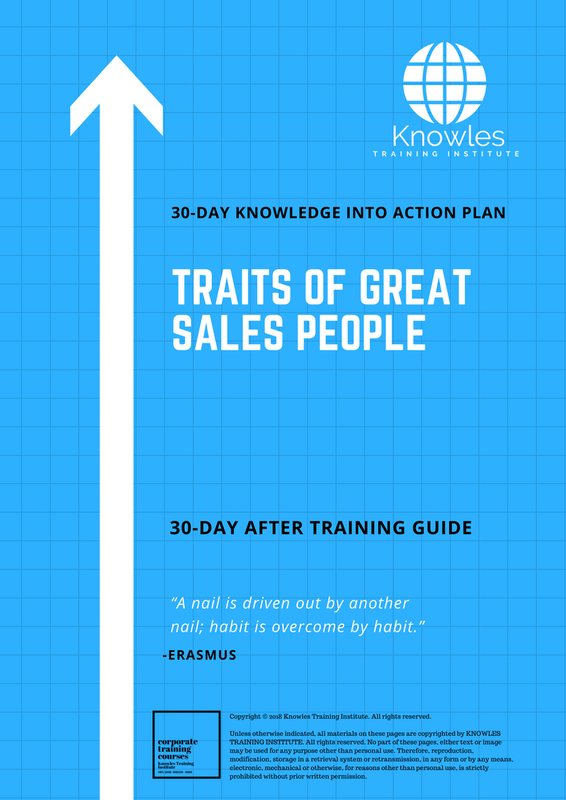 The duration of this Traits Of Great Sales People workshop is 1 full day. Knowles Training Institute will also be able to contextualised this workshop according to different durations; 2 full days, 1 day, half day, 90 minutes and 60 minutes. • What are the duties and responsibilities of a salesperson? • What are the different types of salespeople according to their job descriptions? • What makes a great salesperson? The sales or the customers? • How can you improve yourself to become a great salesperson? • Activity: What do you think describes a great salesperson? How can you achieve these for yourself? 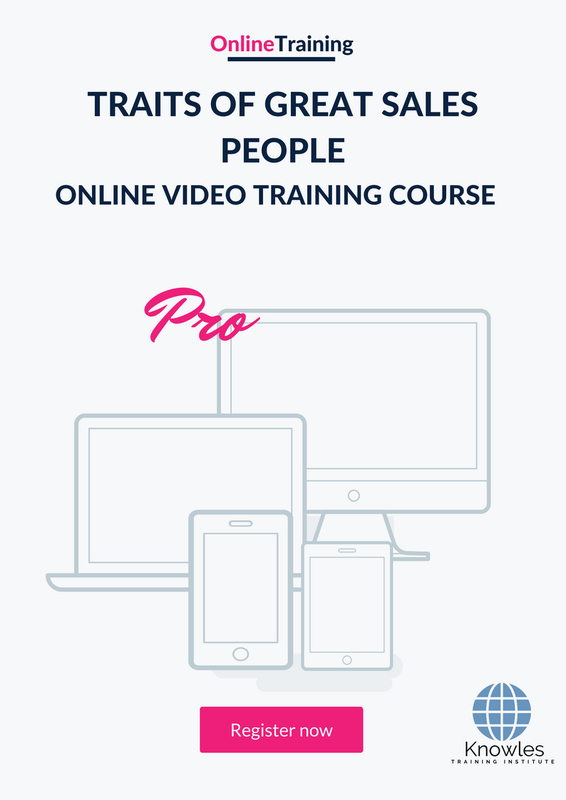 There are 3 pricing options available for this Traits Of Great Sales People training course. 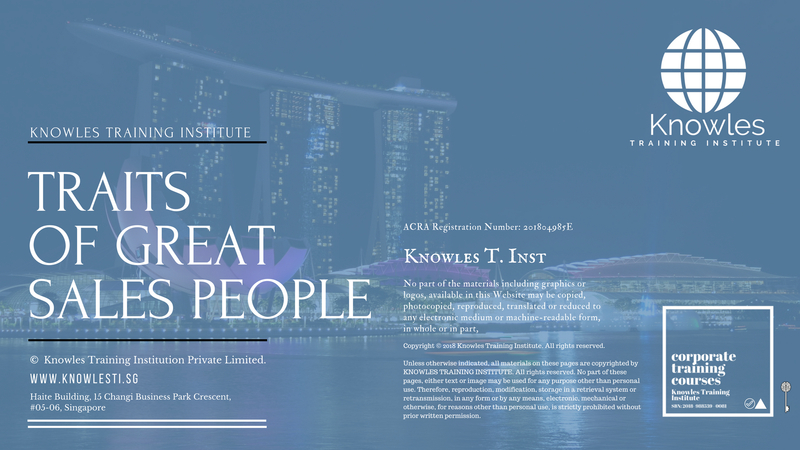 Course participants not in Singapore may choose to sign up for our online Traits Of Great Sales People training course. 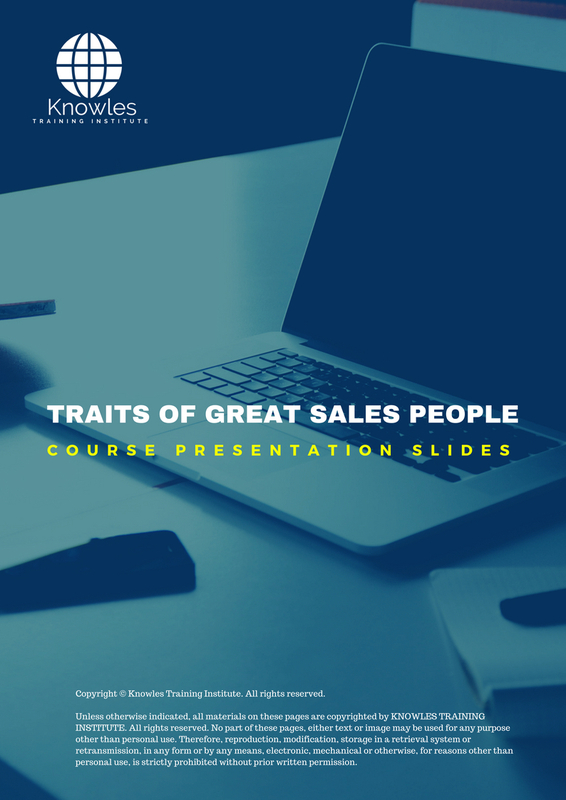 Request for this Traits Of Great Sales People course brochure. Fill up the short information below and we will send it to you right away! 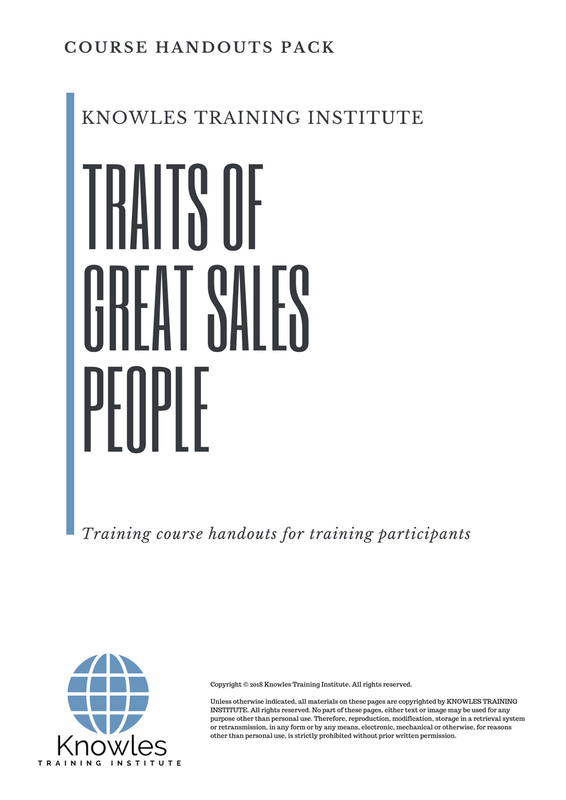 Register For This Traits Of Great Sales People Course Now! 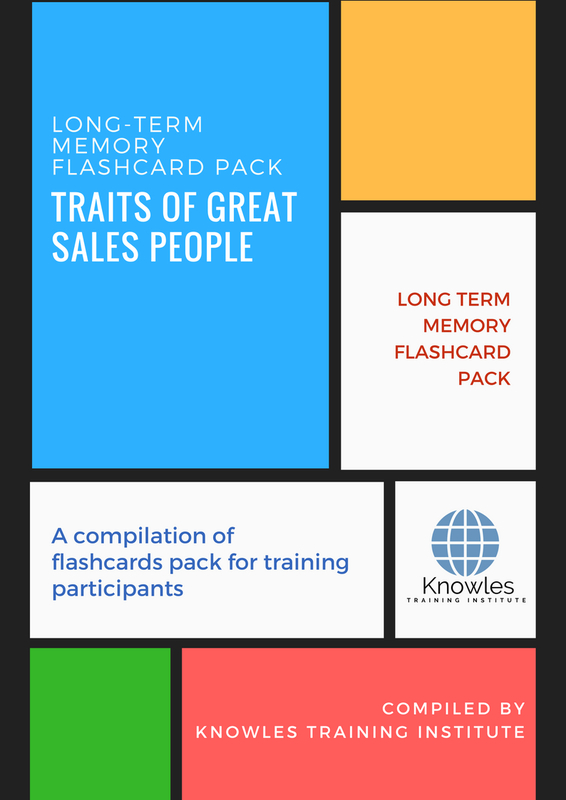 Share This Traits Of Great Sales People Training Course! 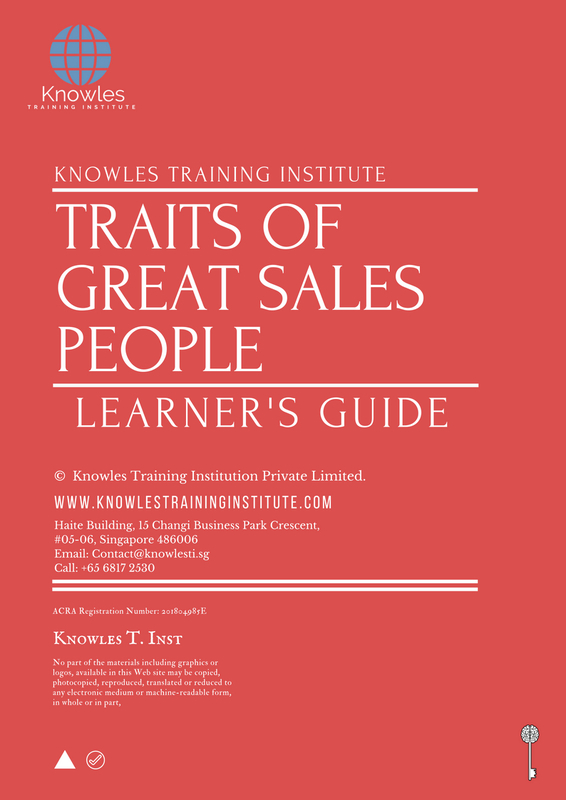 Traits Of Great Sales People course, workshop, training, class, seminar, talk, program, programme, activity, lecture. 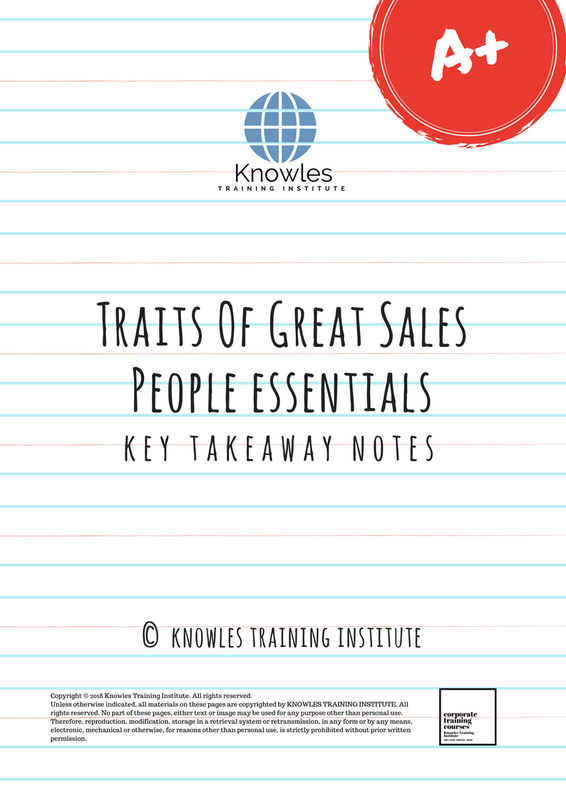 Traits Of Great Sales People courses, workshops, classes, seminars, talks, programs, programmes, activities, lectures in Singapore. Traits Of Great Sales People improvement tips, Traits Of Great Sales People techniques, improve Traits Of Great Sales People, improve Traits Of Great Sales People games, Traits Of Great Sales People improvement exercises, improve Traits Of Great Sales People power, how to have good Traits Of Great Sales People, how to have good Traits Of Great Sales People in studying, how to build up your Traits Of Great Sales People, how to improve Traits Of Great Sales People how to improve Traits Of Great Sales People course in Singapore. Enhance, boost, build up, enlarge, heighten Traits Of Great Sales People course in Singapore. 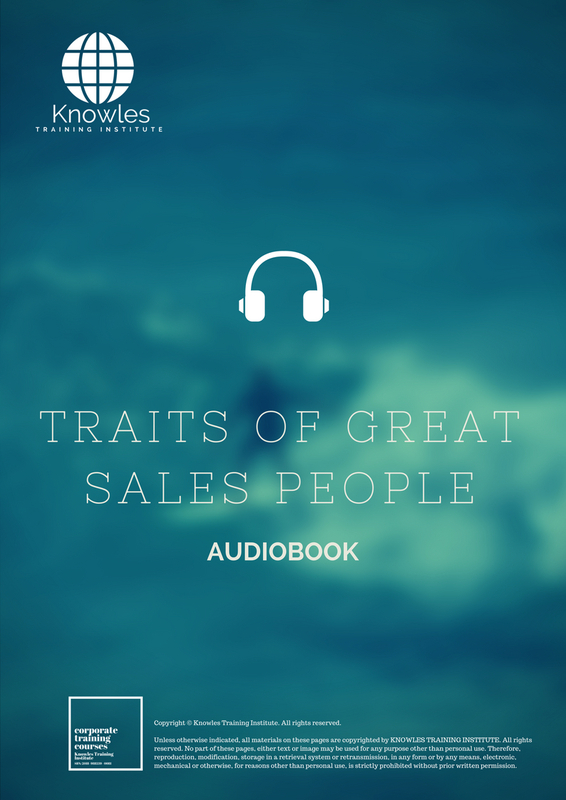 Increase, intensify, raise, reinforce, strengthen Traits Of Great Sales People. Upgrade, amplify, boom, elevate, exaggerate, magnify, grow, gain Traits Of Great Sales People. Develop Traits Of Great Sales People, multiple, power up, beef up, bolster, establish, extend Traits Of Great Sales People. Invigorate, restore, step up, toughen, empower, fortify, regenerate Traits Of Great Sales People. Rejuvenate, renew, escalate, expand, maximize Traits Of Great Sales People. Powerful, mighty, impressive, competent, great, excellent, exceptional Traits Of Great Sales People in Singapore. 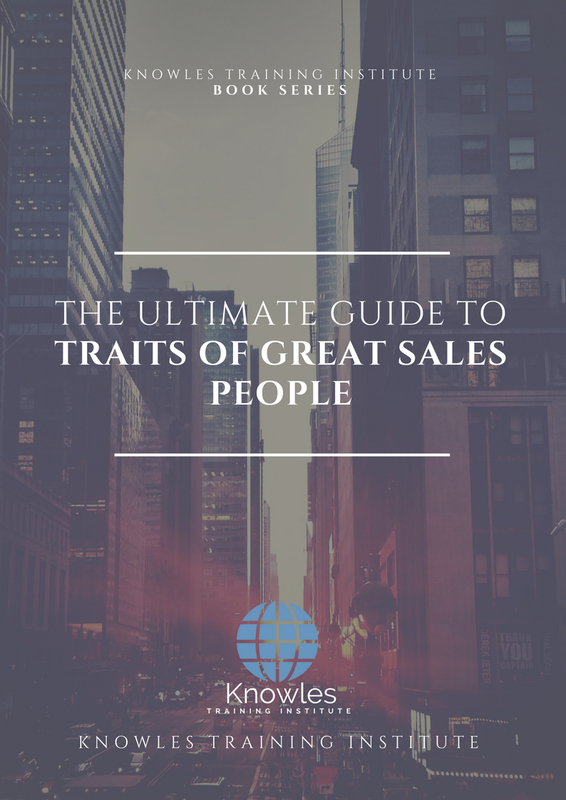 Superb Traits Of Great Sales People. Super, superior, strong, solid, active Traits Of Great Sales People training courses and workshops in Singapore. Traits Of Great Sales People enhancement, booster, building up, enlargement, heightening, increment, strengthening, amplification. Traits Of Great Sales People magnification, growth, development, power, empowerment, regeneration. Traits Of Great Sales People rejuvenation, development, escalation, expansion. 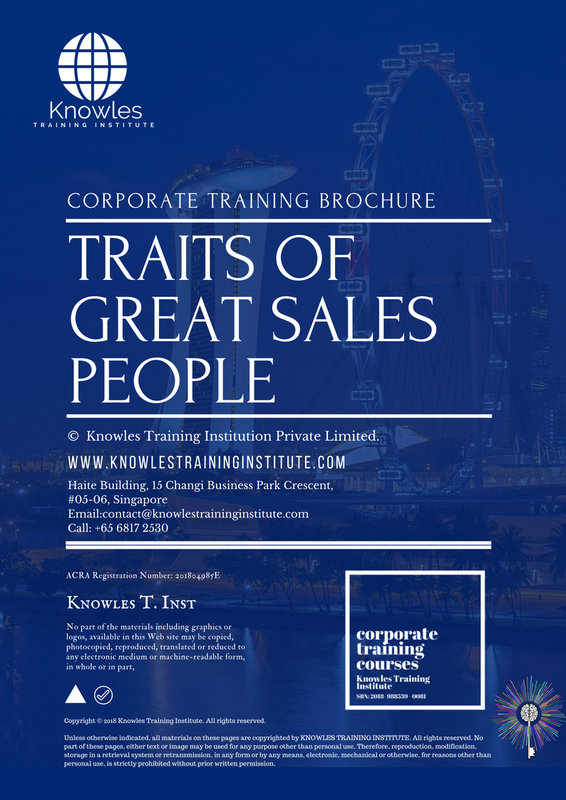 Traits Of Great Sales People maximization, power training courses & workshops in Singapore.